2013 CrazyFly Takii 6'0" Kite Surfboard, Fantastic All-Around Medium Wave and Light Wind Performance. The 2013 CrazyFly Takii 6'0" Kite Surfboard from CrazyFly Kiteboarding offers well rounded control in an ultra durable kite surfboard with top quality materials, construction and performance. The 2013 CrazyFly Takii 6'0" Kite Surfboard is designed for medium waves and also as a fun light wind board. It has quad fin set up and fish tail for cutting tight turns. The 2013 CrazyFly Takii is a speedy board with a lot of control. 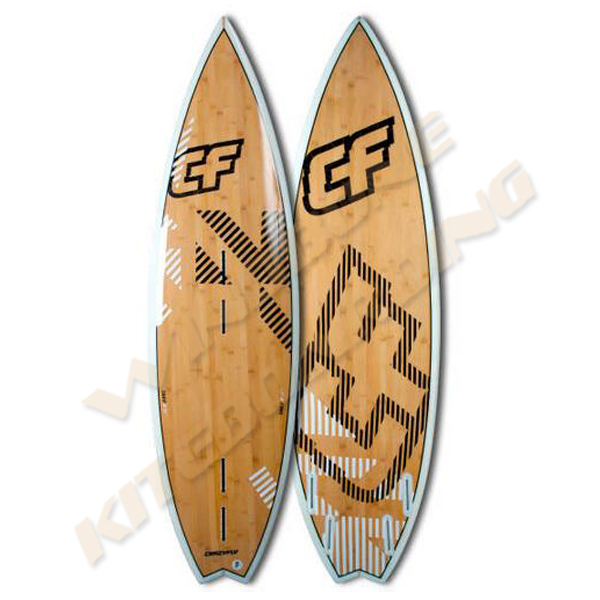 2013 CrazyFly Takii Kite Surfboards are constructed using the latest Bamboo wood sandwich construction. Bamboo overcomes wood with its natural durability, elasticity and is exactly what is needed for superior wave boards. It still remains nature friendly, as bamboo grows extremely fast. The 2013 CrazyFly Takii 6'0" Kite Surfboard comes with fins, straps and self sticking EVA pads. It's your choice of riding with waxed deck or riding with the footpad. 2013 CrazyFly Takii 6'0" Kite Surfboard from WindBone Kiteboarding your Authorized CrazyFly Kiteboarding Dealer Specialists.